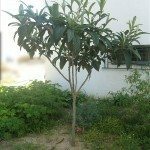 Our newly planted loquat tree is showing signs of distress - leaves are turning brown. It was planted in Tucson and has grown to about 3 feet. But once healthy leaves are turning brown. It gets watered every other day. Could that be the cause? If it does not have enough time to dry out, almost completely, then it can cause an infection. As long as it is not too far gone, you can apply dolomitic lime, and wettable sulfur around the tree out to about 1 or 2 feet from the trunk. This will kill off as much as the infection as possible in the soil, so that the tree can start to recover. Make sure to only water when it needs it, or when it stays dry for too long. They can handle a little drought, but they will need water when it stays dry.